There must be countless reasons behind this argument when you consider the fact that this motion is a combination of the ‘most wonderful time of year’ and ‘the greatest city in the world’. The city that never sleeps becomes even wider awake during the winter months, when day-to-day life seems to get just that little bit more magical. From hitting the giant department stores around Christmas time to ice skating at an iconic-setting, here are some must-dos that will help warm your spirits during a cold, winter visit to visit New York City. Everything looks prettier in the snow, especially a city, and especially one of the greatest cities in the world.New Yorkis almost guaranteed snow in winter and around the Christmas period. I for one have never experienced a white Christmas in 26 attempts. A trip toNew York would surely improve my odds. Whilst snow is viewed as somewhat of a bane of our existence here in the UK, having a dusting or two whilst you don’t have to think about mundane things like commuting to work or getting your car out of the drive is just fine. You may even start to re-appreciate it in the same way you did when you were a kid. And even if you’re not into sledging about and throwing snowballs at strangers, then a nice relaxing stroll through one of the city’s snow-covered iconic parks will help lighten up a dark winter’s eve. You can get some skates on and slide about at various famous locations across the city. 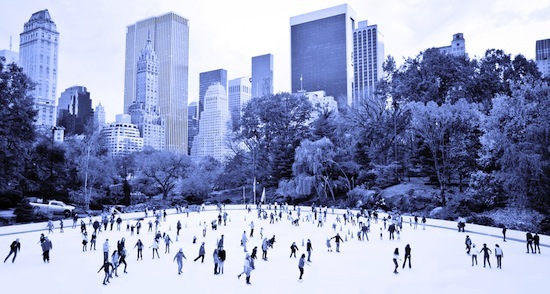 Arguably the most mesmerising and renowned place to don some blades is on the ice rink at the Rockefeller Centre. Escape the winter tourist-ridden sidewalks and have a little bit of room to express your new found freedom, even if you can’t really control where you’re going. You’ll have to strive to get back down to the Rockefeller Centre if you want to witness the mother of all Christmas light celebrations. The tree-lighting ceremony held here is certainly the grandest exterior-illumination event held in the city. If you can brave the crush and make it through a two-hour celebrity-filled program then you’ll finally be treated to a few “oohs” and “aahs” as the 30,000+ lights spark into life and the Swarovski star begins to sparkle. If you’d rather appreciate the magical luminosity of the winter period in a more peaceful setting then perhaps a gentle stroll through Central Park will be more to your liking? New Yorkseems to have a bar scene for every season. The open gardens and breezy rooftop settings that are enjoyed in the summer make way for toasty fireplaces and cosy dining during the winter months. Explore the city and find yourself a snug, quaint local where you can enjoy some of New York’s winter craft ales. Have a tipple or two of a winter warmer beer or some nice mulled wine in a trendy and atmospheric setting. New York isn’t short of winter/Christmas markets for you to get stuck into. From the artisan Holiday Shops at Bryant Park and the Union Square Holiday Market, thousands of handicrafts and artistic products are up for grabs across various pop up stalls. 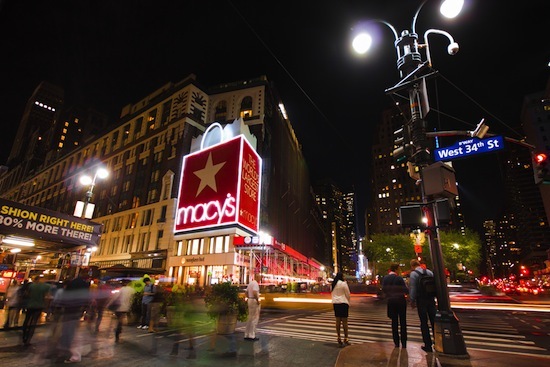 If you’d rather have a warmer shopping experience in the city then there’s surely no better time than the holiday period to hit some of New York’s giant department stores? The cold weather will mean that the ticket line will be shorter, so the winter is a great opportune moment to catch a Broadway show. The winter months welcome a number of themed shows to Broadway; understandably it is Christmas performances that tend to top the bill. The Radio City Christmas Spectacular is a particularly apt show to catch during the winter period. Complete with Santa, this show has been a hit for eight decades. If singing Christmas tunes at the top of your voice doesn’t find you embracing theNew York winter scene then nothing will. If you're thinking about visiting New York in the winter, check out our cheap flights to New York from £399!